It’s that time of year again… Stores are filled with school supplies, big yellow buses driving around town, and you find yourself packing up your belongings in preparation to head back to school. For many, this is an extremely exciting time, simply because this means you will once again be linked up with your closest friends for the next eight months. However; every year at the beginning of school the thought of, “How am I going to be able to balance my school work with my social, regular work, and physical health life?” reappears. The answer really is simple: DO WHAT IS BEST FOR YOU. The absolute perfect advice for a good “balance” in life does not exist. 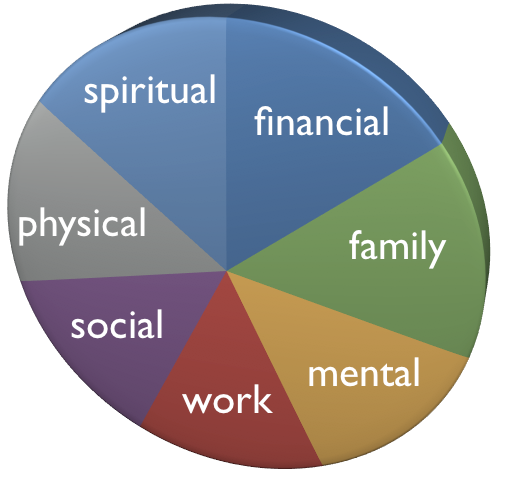 Every single person is different when it comes to prioritizing their responsibilities. Now don’t get me wrong, there are some pretty obvious suggestions that can be made, such as maybe not going out with friends the night before a big exam, or skipping class just to get a work out in. Those are just some of the simple things that almost every parent tells you before you get to school. What it really comes down to though is finding the correct balance for YOU. If this means going to the gym one less day a week to either catch up on school work or hang out with friends, so be it. Your ultimate happiness will come when you can find that perfect or near perfect balance in your life. With that being said, this adjustment may take a week or two, so don’t become discouraged when the beginning of the school year seems quite stressful. Also, it may be relieving to know that almost all of your friends are going through this transition period with you, so don’t feel like the only one who may be struggling right off the bat. 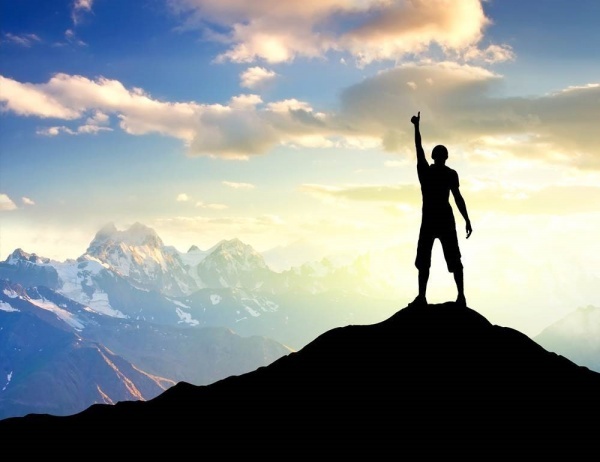 Like I stated earlier, the perfect advice for a balanced life really doesn’t exist, however what I want to challenge you to do is find that perfect advice for yourself. Try your best not to let others around you influence your priorities, because no one really knows you better than YOU. Sometimes staying positive can be difficult. The more you practice positivity in your daily life, the easier it can become. Positivity can greatly benefit your quality of life and overall health. 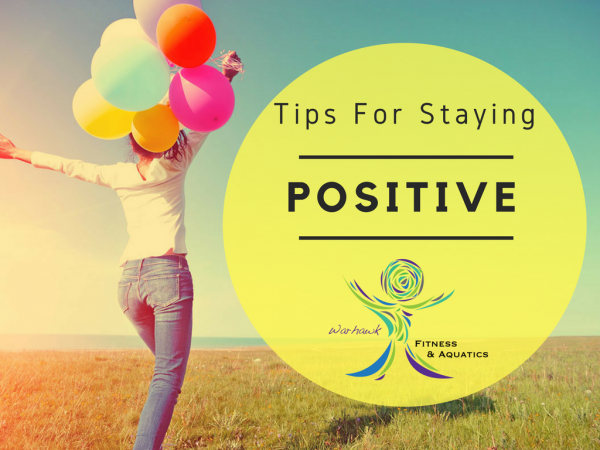 Here are some tips to help keep a positive mindset. Get up and get your blood flowing. Whether you go for a walk or hit the gym, a little physical activity can make you feel a lot better. It has been found that exercise releases chemicals that can make you feel happy. Spend some time relaxing and reflecting silently. Meditation can expand awareness within an individual. Having a clear connection between the mind, body, and soul can help release negative emotions. It is important to take care of yourself and put some of your needs first. Make sure to do the simple little things for yourself to avoid stress. Put on some of your favorite songs and get lost in the music. Dance, sing, or just sit back and listen. Take some time out in your day to relax and just get lost in the music. Researchers have found that making yourself smile has can actually make you feel happier. Try to smile a little more and see how it makes you feel! Choosing to smile can put you in the right mindset to stay positive. Go out and get some fresh air. Getting away from your everyday busy life can help you destress. Spending some time off in nature can be a great time for you to do some self-reflection. Turn off your cellphone and distance yourself for the drama around you. Taking a break from social media can reduce your stress and help you worry less about the things going on around you. Try to get enough quality sleep each night. It has been found that getting enough sleep can help improve your mood. Remember that positivity is contagious! Spread your joy and positive attitude on to the others around you. Also, surround yourself with people who help lift you up. Take life one day at time and do your best to enjoy every moment. I want you to take a moment to reflect on your day, more specifically; the parts of your day when you were sitting down. Start a mental count, how many times did you sit and for how long? We might not always be conscious of the amount of time we are off our feet. For example, I drive a lot for work, often up to 4 hours a day. That is four hours for work alone I am sitting! Once you have tallied your results you might have a wake-up call like myself. But why is this count so important? Having your legs inactive for long periods of time can take 2 years or more off of your life according to the Pennington Biomedical Research Center. Your legs are a combination of many large muscles (hamstrings and quadriceps for example) forming one of your largest muscle groups in your bod. When you sit 3 or more hours a day the negative impacts can take effect. Reader’s Digest looked into what they call “sitting disease,” which as we mentioned is being off your feet for hours on end at a time; their antidote states that scattered activity throughout your day can counter the negative influence sitting has on your body. Activity such as; taking the stairs, walking at lunch, working around your home, or standing at work can provide your legs with enough activity. Their article even stated that continuous activity may be more beneficial to one’s health than an all at once workout session (a combination of the two may be ideal). However, if you are like me, and you are trapped in a seated position with no way to take an “action break”, you are not left without hope. Even doing small activity such as doing leg lifts in a seated position can get your blood flowing and can support a longer life expectancy! Our solution is quite simple, move! Move at work, move at home, and cut back on using your built-in-cushion. Until next time my friends… Carry on! When you think of exercise, we all imagine something different, because we are all different! You may imagine strenuous activities such as sprinting or weights — the ones that make you breathe hard, turn flush and drip with sweat. Or maybe you think of jogging or yoga. There is not only one type of exercise, and it is critical for boosting fitness to include multiple types of exercise so you healthy doesn’t become one dimensional. 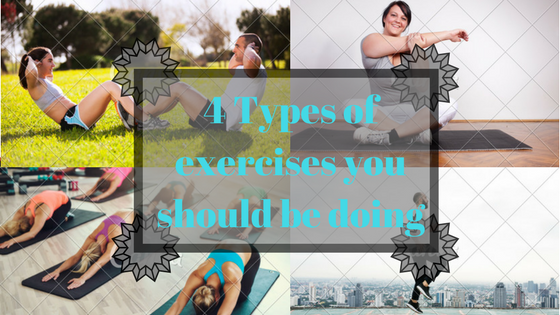 There are actually 4 types of exercise that are important for everyone to include: aerobic training, strength training, balance training, and flexibility training. Each type of exercise is important in its own way, and doing all four types is the way to maximize your fitness and prevent injury. But maybe people think they know what they are, some may even have not heard of the term aerobic. Here is a brief overview of what these are and their benefits to them. Strength exercises; such as weight lifting, push-ups and crunches, work your muscles by using resistance (like a dumbbell or your own body weight). This type of exercise increases lean muscle mass, which is particularly important for weight loss, because lean muscle burns more calories than other types of tissue. Whether you’re 100 lbs overweight or just need to lose the last 15, strength training is one of the most effective ways to burn fat and build muscle. Balance exercises improve your ability to control and stabilize your body’s position. This type of exercise is particularly important for older adults, because balance gets worse with age. But balance exercises can be beneficial for everyone, including people who have gained or lost a lot of weight or those who become pregnant, which can throw off your center of gravity. These exercises are also important for reducing injury risk. For example, if you sprain your ankle, you could be at risk for reinjury if you don’t retrain your balance. Flexibility exercises stretch your muscles and may improve your range of motion at your joints. They can improve your flexibility, and reduce your risk of injury during sports and other activities. There are two types of flexibility exercises: static stretching, in which you stretch a muscle without moving, and dynamic stretching, which combines stretching with movements. So the biggest benefits from stretching is improved flexibility, reduce of injury, and reduced lactic acid in the muscles. Ideally, you should include all four types of exercise in your workouts. But that doesn’t mean you have to do four separate workouts. You use some exercises together, like strength and balance training. For example, when you squat, you do strength as well as balance. Some workouts, such as yoga, incorporate strength, flexibility and balance exercises. It does depend on age and goals of the individual, but you should really try to do all four types of exercise in a training session.